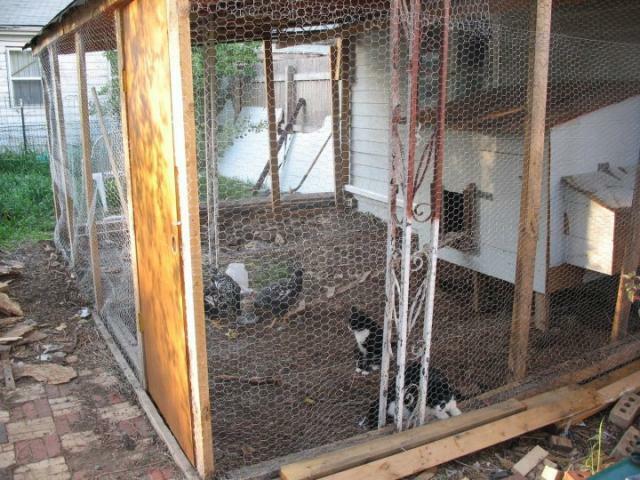 Salvaged Materials Coop + cat enclosure! I have 1/3 an acre in Lakewood, Colorado which I just purchased last year. I'm focused on transforming it into an urban homestead -- a work in progress. Starting out this year with one garden bed, hopefully transforming the front lawn into a medicinal herb garden by fall, and have plans for a bee apiary, lots more garden beds, and subsistence egg-production (and hopefully eventually total subsistence urban farming). 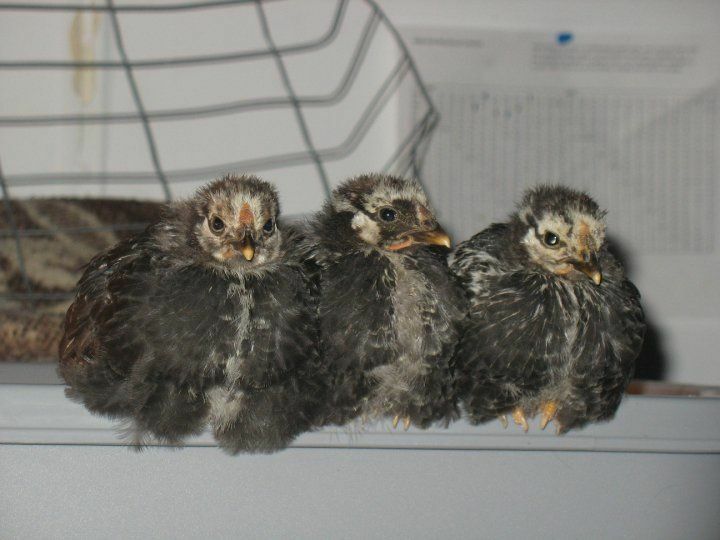 I got three baby Silver Laced Wyandottes from a friend earlier this year, in the first week of March (they were two weeks old). a Norwegian Buhund, Moose;and three female mutt cats, Denali, Athena, and Mau Mau. Oh yeah, and the Betta fish, Devo. as it is -- but if I did I'd think that would be the most responsible way to eat it (raise it humanely myself, slaughter myself). 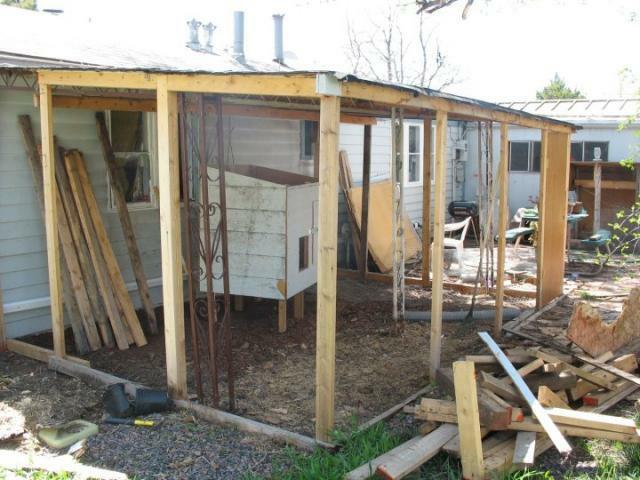 Started constructing the coop later that month. It's been a long process. I decided to re-use an old shed-frame from a weird shed that was semi-attached to my house. 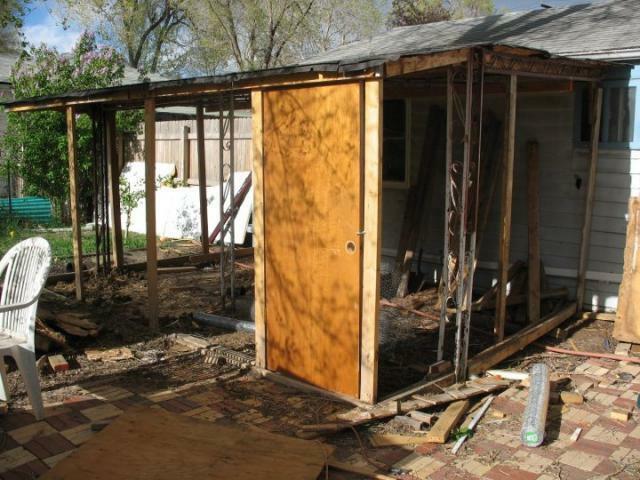 We decided to demolish it last year, but one day I realized that rather than taking the frame down completely, I should just fence it in and throw a hen house in there. I also had a good amount of 2x4s and wood paneling left over from the demolition to use as salvaged material, rather than throwing it away. Waste not, want not! This is the base to the hen house and the start of a nest box. And a couple of weeks later, I had a mostly finished hen house! This was around late April. 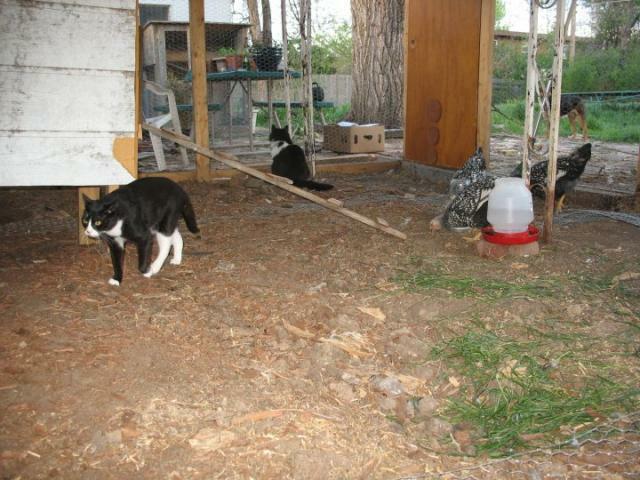 By this time the girls were nearly two months old and it was warm enough outside for them to start living outdoors. 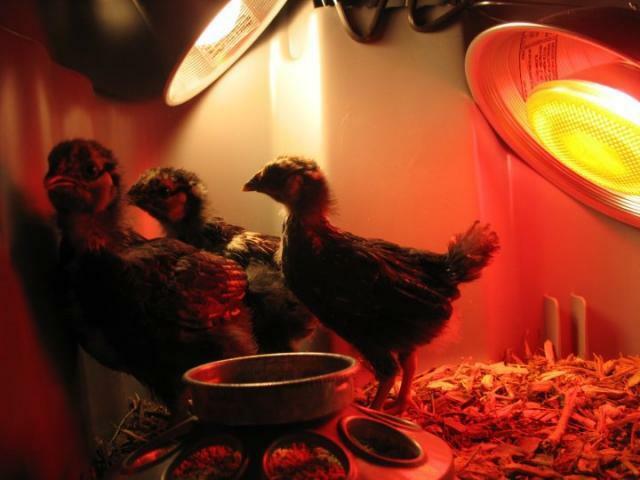 Not to mention they kept finding ways out of their brooder bin and coming home after work to chicken poop all over my spare room was never much fun. The big coop wasn't going to be done for another month or so (I have a 40 hour per week job, so I can only work on it in my small amounts of free time). 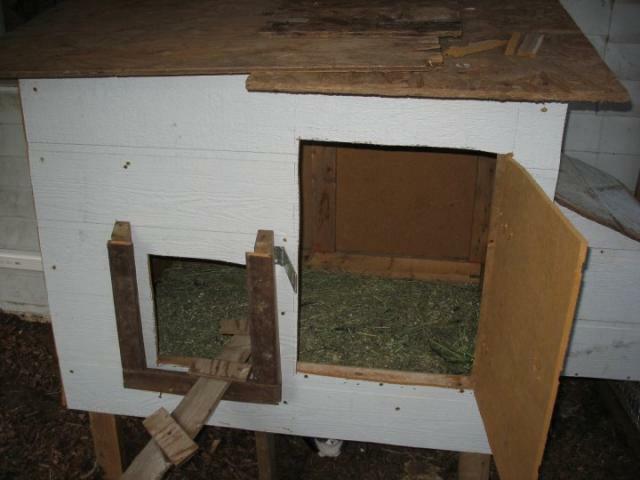 Fortunately, in the meantime, I scored an awesome mini-coop for free off of craigslist. Someone found it in their backyard when they moved in and didn't want it, so they gave it to me! I added some security features (a lining of hardware cloth all along the bottom), and voila! New temporary chicky-home! 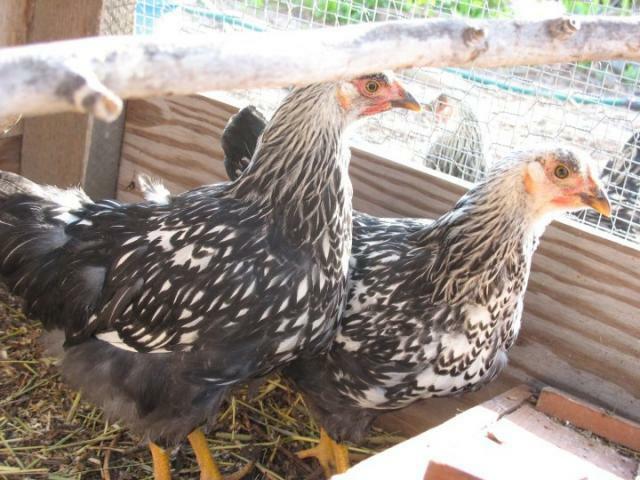 They patiently awaited their new, big home, and I allowed them to free range as much as possible, because the mini coop wasn't nearly enough room. The little details are really what took so long in building the big coop. 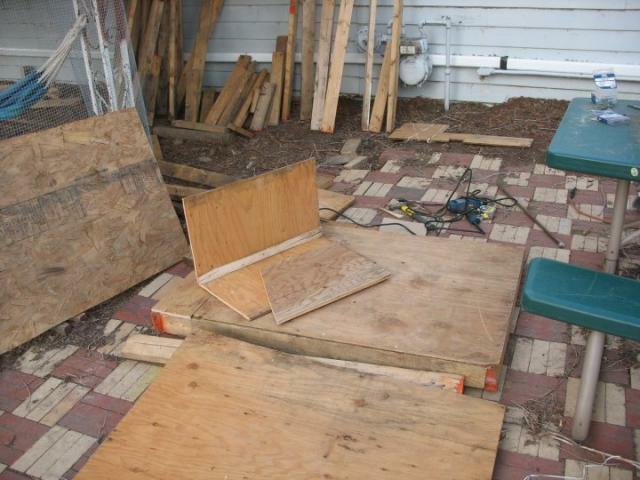 Getting the door to fit (an old closet door I found by a dumpster), fully framing the coop so that there would be no gaps where predators could find a way in, finding ways to pinch pennies in terms of all the chicken wire/hardware cloth I was going to need, etc. etc. 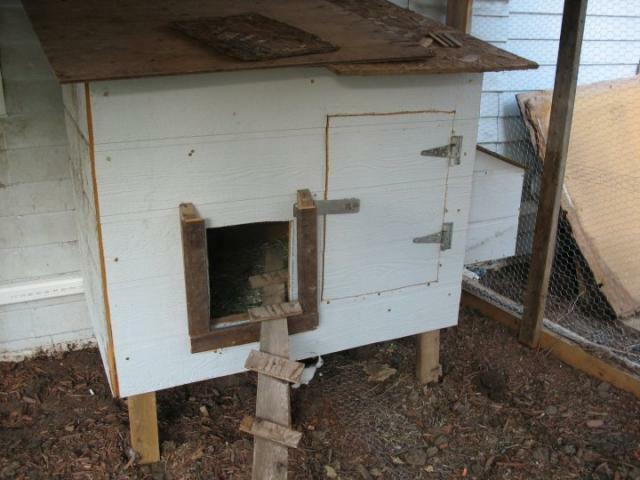 The coop and hen house are probably a good 90% salvaged materials. A friend gave me a big chunk of left over hardware cloth, but I still wound up having to shell out some cash for two rolls of chicken wire -- some for the floor of the coop, and the rest for fencing it in. Other than that, all I had to purchase was a box of screws, a few L-brackets, two hook-and-eye locks, and a bunch of staples to tack down the fence to the frame. The only problem with that set up is that occasionally the chickens get kind of sassy and start pecking at/chasing the cats around. That's when the cats hop back in the window. Eventually I'd like to get some higher shelving/cat structures in there so the cats have a more interesting (and safe) place to hang out. 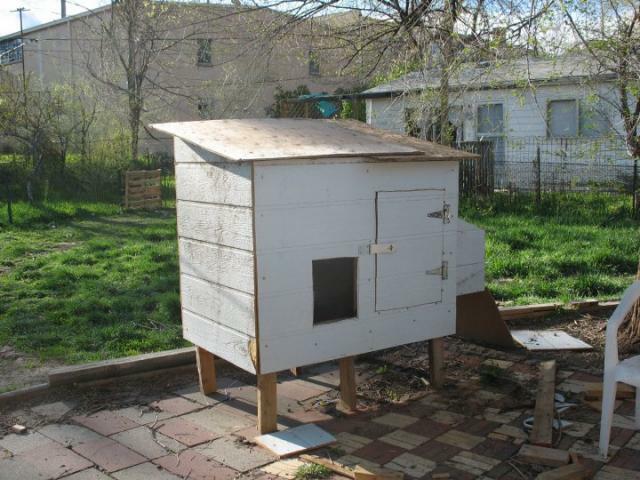 Here is the almost complete hen house. I haven't yet attached the roof, mostly because it's super warm outside and I haven't had the time. Eventually this will be done, but in the meantime it makes ventilation easier. I also added a make-shift sliding track for the pop door, so it'd be secure at night (the pop door itself is sitting on top of the roof in the photo). I re-used the hinges and locks from the old shed. 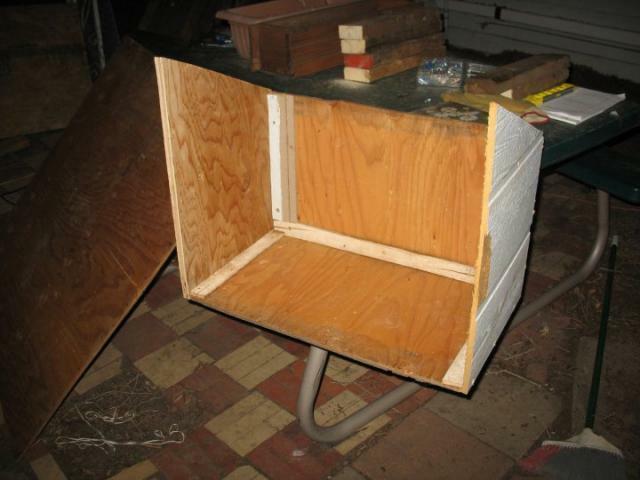 Here is a close-up view of my almost-complete nest box. I still need a divider in the middle, need to make the entrance holes larger, and need to dry out that grass so it makes proper bedding. 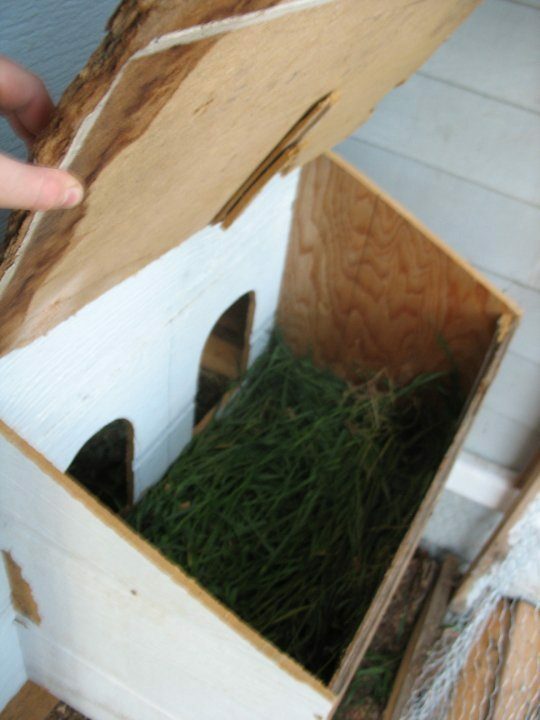 The roof of the nest box is rather shoddy, mostly because it was a last-minute add-on to be replaced before winter. Pretty darn good for my first attempt at building a structure in my free time out of an old shed, if I do say so myself. Nice set up. I am concerned that you used chicken wire to enclose the run. 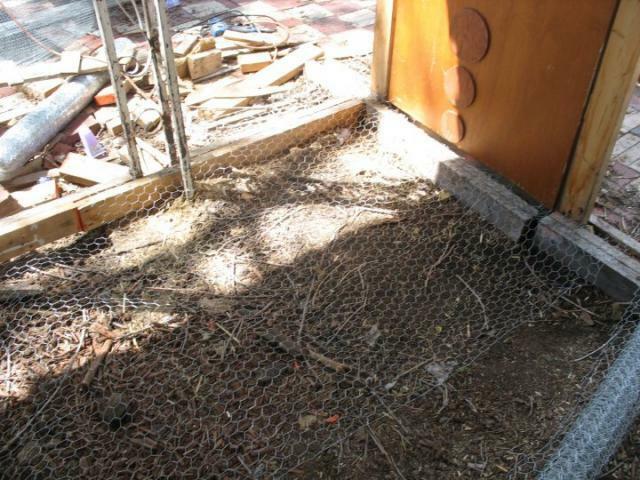 Chicken wire keeps chickens in , but does NOT keep predators out!! I am also surprised that the chickens don't fly into the house through that open cat window! LOL. Your chicken coop needs some more ventilation. Perhaps cut out an opening and the cover it in hardware cloth ( to keep predators out and chickens in). You could use the cut out part to attach to a hinge or two and use it as a shutter if it gets cold where you are. Thanks for sharing your coop and ideas. Would love some more construction pictures. Chicken cloth generally is a bad idea for predators. Lovely cats!